When Buchwald compiled his Handbook of Iron Meteorites in the mid seventies of the past century, the metric scale bar was on every meteorite curator's desk. 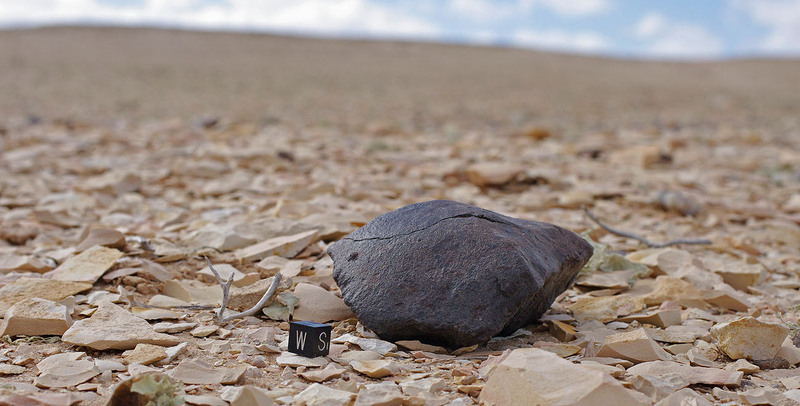 Different models can be seen with many of the specimen pictured in the three volumes of the Handbook since the metric bar is the ideal reference scale for any object larger than a man's fist. 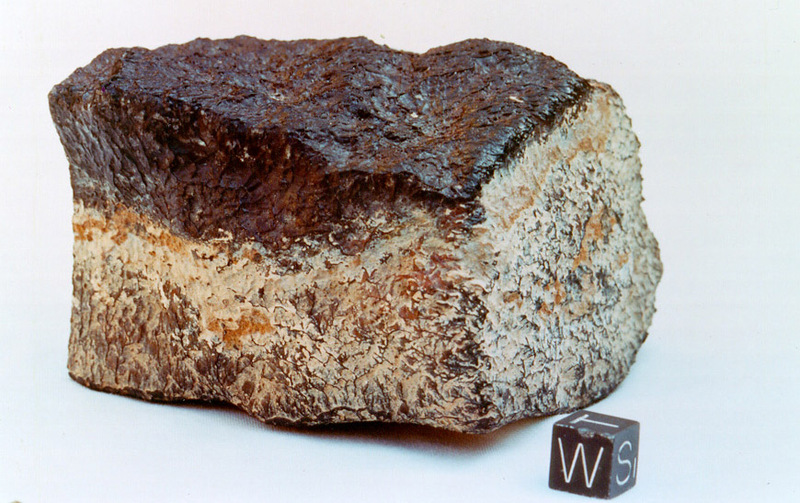 Bob made these cubes available to a limited number of fellow meteorite prospectors and dealers, but he still considered the use of a cube-scale as a personal USP. So it was his decision to forebear from marketing the product on a wider base. But the merciless reality of a deregulated market, like the one for meteorite reference tools, didn’t care for the creator’s intentions. The demand for the Verish-type cube increased and it was just a question of time before some foresighted person would recognize the economic potential. At this point of the story, a strange phenomenon, resembling strong similarities to the Widmanstätten – Thomson case, occured. With Bob’s concurrence a man started his cube production career whose name would stick with scalecube history like the glossy black crust to a Millbillillie. It was Peter Scherff who became famous as the cube-scale tycoon. Until the present it’s a common misconception that the Verish-type cubes are Scherff-type cubes, but actually, the opposite is the case. By 2003, the plastic cube-scale distributed by Peter Scherff was the most common reference tool seen on meteorite auctions at ebay. But the availability of the new standard reference did not only bring improvement. After heavy duty, the endurable Verish-cube with the average calibre of 10.35 mm tends to lose it’s fusion crust of acrylic lacquer, revealing a blue skin. We have seen veterans of the first production line that underwent five or more repaintings and are still in service. When we started to redesign the meteorite scalecube, we wanted a solid metal as base material. Not ferritic, as we had enough Fe-oxide on our Campos to look after, but some alloy that shared a melted and recrystallized past with the meteorites it would be on display with. Dur-aluminium as used in aircraft engineering seemed to be a good choice. A 1 m by 10 x 10 mm bar of dur-aluminium was purchased, enough to produce some 90 cubes, the cut loss in mind. As we intended to manufacture only a single cube for our own need, we did not worry much about cut loss anyway. A manufacturer was found who cut and polished a cube with tolerances less then +0.05 and – 0.01 mm. By this time, we still planned to apply a permanent black lacquer to the cube. This would have meant a compromise since the color would have bleached proportionally to light exposure. Depending on the intensity of use the cube would have slightly changed colors in time. It was a fellow collector who advised us to use a reference safe method of coloring our cubes. Since the chosen material was an aluminium alloy, the anodizing technique could come into consideration. By applying a current to the cube, a 0.05 – 0.10 mm thin coating of aluminum oxide is grown out of the surface during anodizing and then becomes aluminum hydrate which is extremely hard. The porous nature of the anodized layer allows color pigments to be embedded in the coating. This was a good plan but we had lost production costs slightly out of focus. Our anodized scalecube would have cost the fortune of 55 USD. Venture capital had to be raised, investors had to be won for our vision of a better cube. A post to the Metlist was placed, announcing a limited number of engraved cubes to a cut price. This instrument achieved overwhelming international response. Altogether, 48 pre-orders arrived, enough to carry on with what was now a multinational joint venture. A first serial of 40 cubes and a second of 50 was ordered and shipped across Germany to a second subcontractor for anodizing. This company had a lot of experience in coating aircraft fuselage, but the 10 mm scalecube took them to their limits. The main problem was the size. To apply the electric current in the standard method, the aluminum part is normally hung on metal “racks” which are designed to hold many of the same parts spaced an even distance from one another. Then the racks are lowered into the diluted acid and water to permit the electric current to flow. While the anode of the electrical circuit is connected to the rack the stainless steel tank containing the dilution serves as the cathode. But how to attach ninety 10mm cubes to the anode? A special clamp system had to be designed to hold the cubes in position, thus leaving submilimeter sized blank spots on the contact points. Identifying a skilled engraver and initiating him to the mystery of meteorite reference tools was among the most challenging tasks. Transferring the construction drawing that included all the metrics and relative positions of the graphic elements into the CNC program to operate the milling head was another. Loss through waste and a small experimental serial engraved by laser reduced the remaining serial to 72. A special chuck had to be made as the 10mm cube was too small to fit in the standard version. Defining a zero point for the micro navigation of the millhead was another challenge. While we were already preparing the IPO of our ambitious business, our engraver discovered that each of the 72 cubes he was in charge of had six surfaces of which each had to be clamped individually. He informed us that due to the ‘unexpected operating expenses’ prices per unit had to be renegotiated. Finally, on September 9, 2005, we had the first prototype of the alpha serial engraved. Production costs were always a critical factor. Meteorites had to be sold to improve the liquidity of our venture and more than once our investors threatened to pull the plug to our enterprise. Final Meteorite-Recon beta-series photography scale cube shown with a 131.5 g individual of the Taousz (“Breja”) meteorite. Still potential for optimization remained. This was the reason why in early 2009 new construction drawings were made and preparations were undertaken to produce a new series. Meanwhile other players discovered the field of scale cubes as an area of interest and launched their own models with such ground breaking innovations as an additional “1 cm” engraving or a serial number. Because our own demands strictly focussed on fitness and practical usability we aimed for a clear and straight design. Because we were convinced, that the original creation was perfect for the task of meteorite photography we aimed for a meteorite photography scale cube that was as close as possible to the original NASA design. This in in mind the 2009 series was completely remodeled in order to match the original NASA cubes. The resulting version became known as the beta variant. Apart from minor changes in symmetry and precision the new cube model displays finer engravings both in depth and size. A new anodizing process was applied allowing for complete coloring with zero blank spots. Quality control was tightened, with the result that the cubes which passed the final approval were indistinguishable from each other. Of the beta variant 90 cubes were produced and distributed among museum curators, private collectors and scientific institutions, like the Massachusetts Institute of Technology (MIT). Today both our cube series, the alpha and beta variant, can be seen performing duty on the websites of dealers and collectors around the globe. They are a seal for the professionalism and dedication of meteorite photography. From ebay offers to photo publications of internationally reputed museums. Now, when you see a NASA-type 10 mm engraved meteorite photography scalecube you know where it came from.